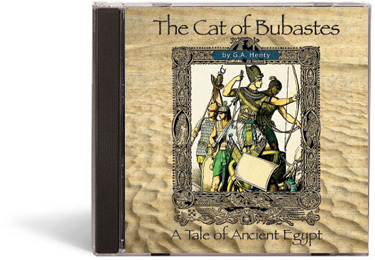 A great addition to any study of ancient Egypt or just for fun. Join the young prince Amuba and his charioteer Jethro as they are carried away in slavery after losing a battle to Egypt. After their new master, the son of a priest, accidentally kills the sacred Cat of Bubastes, Amuba and Jethro help him and his sister escape and all eventually win their freedom. The story occurs before the Exodus and Moses makes a brief appearance. One character in particular, the slave girl Ruth, speaks strongly for the God of Abraham. This is a computer CD. The audio files will play on any computer CD drive, DVD player or MP3 compatible CD player. MP3 CD players are available at most large electronics or discount stores. The audio files on this CD will not play on a standard CD player. That means you only have one disc instead of ten or twelve (to get lost!) for each book.